(P1) The FAA is adopting the ICAO format for domestic flight plans starting sometime early next year, likely by the end of January. What this means is that you will need to provide additional information when filing flight plans, using the format previously used for international flights. Pilots are encouraged to use the ICAO format for all flights now to ensure a smooth transition once the domestic flight plan format is eliminated. (P2) There are many similarities between the former domestic FAA flight plan format and ICAO. However, when it comes to aircraft equipment suffixes, there are some major differences. The ICAO format requires a wake turbulence category based on the aircraft. ICAO also has more specific coding for transponder equipment, which specifies ADS-B Out and In, for example, and avionics installations, which includes several additional codes for avionics capabilities such as LPV approaches. The more detailed codes can be included to provide more information for ATC, but they are not required. The ICAO format also includes codes for emergency equipment, which will be helpful in search and rescue situations. 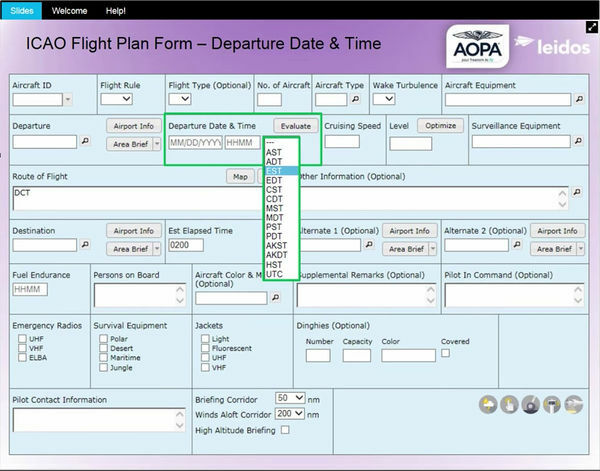 (P3) Another major difference with the new flight plan form is the format for the departure or destination airport if the airport identifier is not in the standard four-letter format. If one of your planned airports does not have a four-letter code, you need to enter ZZZZ in the departure or destination section of ICAO form and specify the identifier in Field 18 of the form. (p4) The switch was originally set to take effect in October of last year, but aviation advocate groups convinced the FAA to delay the transition. In addition to providing pilots and flight plan provider services more time to get used to the format, the training course required for the SFAR area in Washington, D.C., needed to be revised based on the new ICAO format. In your opinion, do you think this change will have a positive or negative effect on pilots? Why? In your opinion, do the aircraft equipment suffixes make a pilot’s job easier? Why or why not? Do you agree or disagree with the FAA adopting ICAO format for domestic flights? Why? When will the FAA make the change to the ICAO format for domestic flights? The ICAO format will assist in ___________ and ____________ operations. If an airport doesn’t have a 4-letter identifier under the new flight plan, what code must be entered? In the beginning, this change was suppose to take effect in _______________.